The Grampians were first settled by Aboriginals 5,000 years ago, which by Aboriginal standards is quite recent when compared to areas in northern Australia that were first settled 35,000-50,000 years ago. 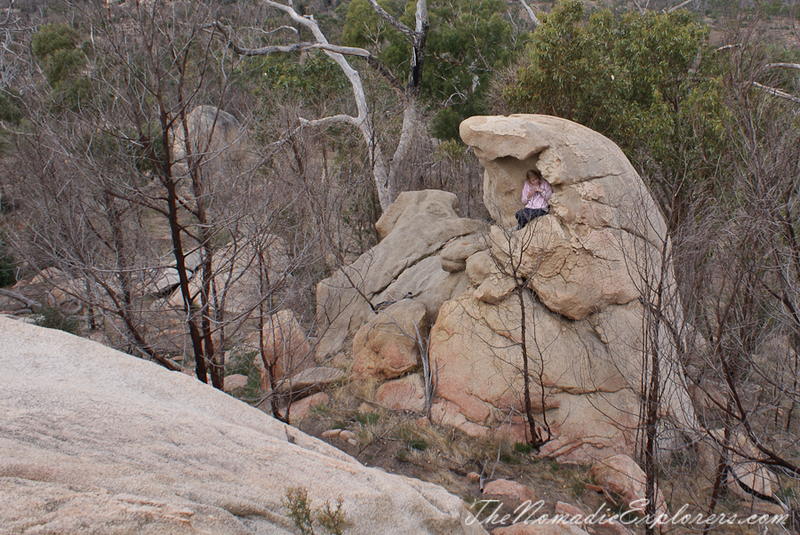 The Aborigines called the mountains the Gariwerd mountains and it became the heart of the Aboriginal culture in Victoria. 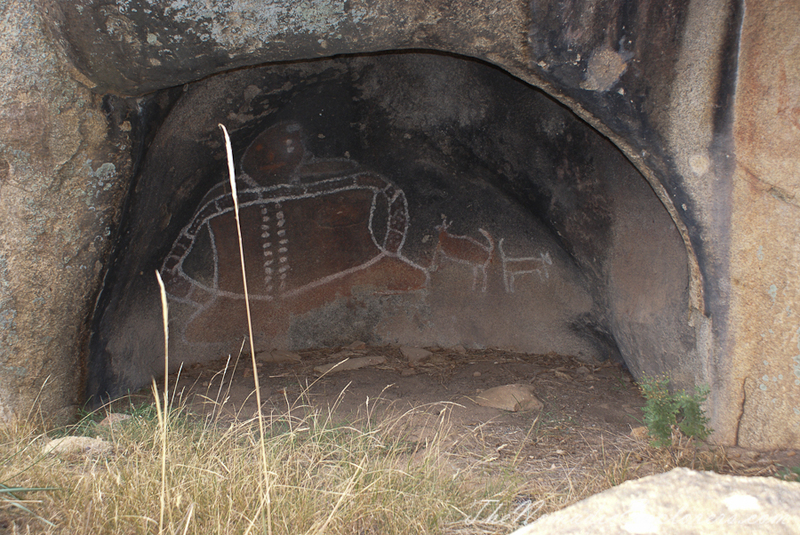 The region has the largest number of rock art sites in southern Australia – more than 80 per cent of Victoria's rock art sites. Approximately 60 art sites, containing more than 4,000 different motifs have been identified in the national park. Five shelters are open to the public and are all easily accessible: Manja and Billimina shelters in the Western Grampians, Ngamadjidj and Gulgurn Manja shelters in the north and, one of the most important sites in Victoria, Bunjil's shelter, near Stawell. We visited the Bunjil’s shelter on our way back from Halls Gap to Melbourne. 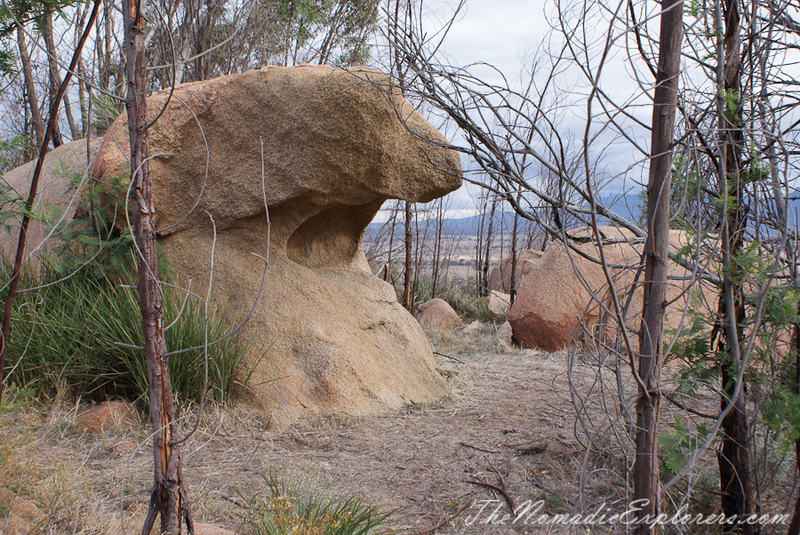 According to Aboriginal legends, Bunjil is a principal legendary hero, the creator who provides for all and remains as a protector of the natural world, his people and their beliefs. When Bunjil finished his creation works he transformed into an eagle, flying high into the sky, where he still lives today. The painting has been protected by a grill since the 1960s. The exact ‘white-years age’ of the original painting of Bunjil is not known. Examination of pigment samples in the red colouring and the white outlines of Bunjil and his two dingos tell us they were painted using traditional clay ochres. In 1911 parts of the body of Bunjil and the second dingo (dog) were over-painted with European whitewash, and the tail of the first dog was marked with red lead paint. Graffiti that appeared in more recent years continues to be removed. The dingos in the painting are Bunjils’ helpers. The shelter itself is small and not as impressing as some of the rock art sites that we’ve seen in Kakadu NP in Northern Territory. 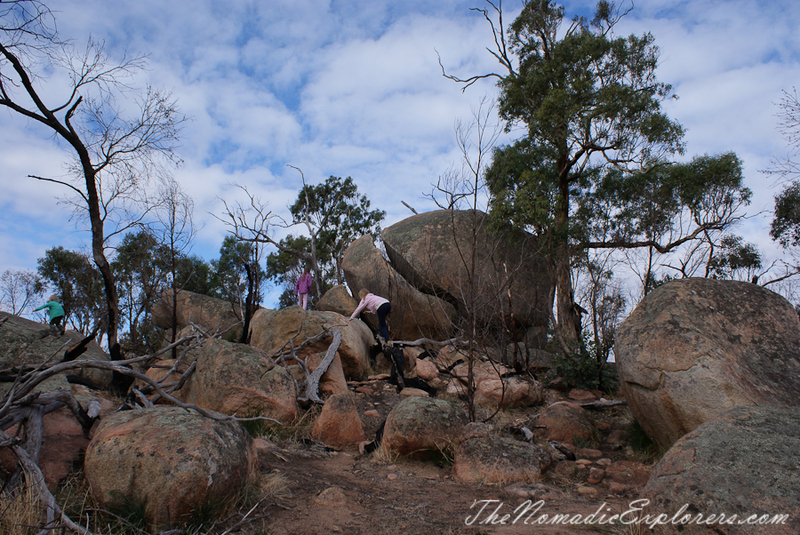 However, we were really impressed with the size of the rocks having a short stroll to the top of the nearest hill. Much of the Aborigine land was lost which made hunting and grazing for food more difficult. Aborigines began to starve while others began to steal sheep for food. This gave many settlers the excuse they needed to shoot the Aboriginals. This early colonial history was not good for the Aborigines though things are better now, but still it is sad to see this rock art having to be protected by bars due to vandals. 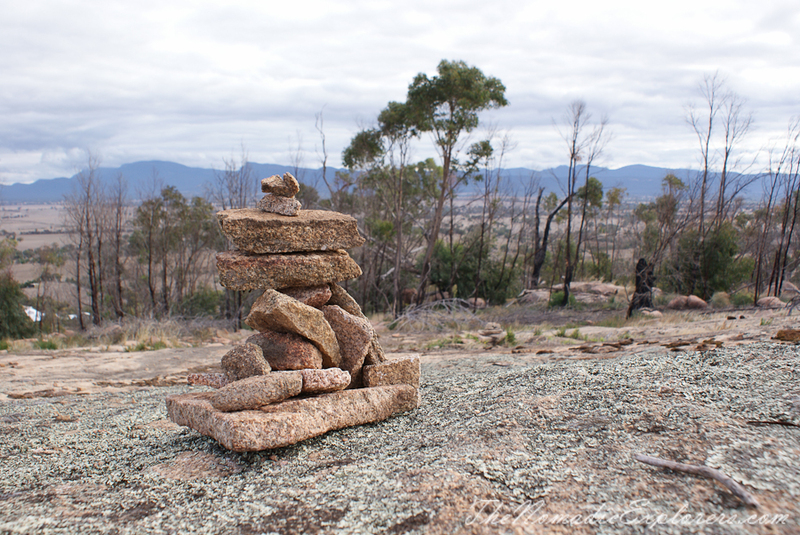 If you are interested to get more information about Bunjil, visit the Brambuk the National Park and Cultural Centre in Halls Gap - it is open daily from 9.00am to 5.00pm, entry is free.